C-Trak's have put together a few questions and answers about our lineshaft conveyors that may help you decide what type of conveyor is best for your application. If your questions are not answered please call us for our help. Q. I need my conveyor to go round a corner can line shaft conveyors do this? A. Yes Powered Rollers can easily be adapted to form curves to go around bends. Q. I need to have a long straight length of conveyor can one motor be used for this? A. We can provide a motor that will power in excess of 100 metre so it cuts power usage down to a minimum. Also saving time, maintenance and of course costs. Q. Can I run my lineshaft conveyor at any speed. A. High speeds can be achieved with power rollers but it is harder to use slower speeds especially when the product is heavy. Each case must be looked at indervidualy to decide if it is possible. Q. My factory is busy but we need to be able to communicate easily with each other how noisy are powered rollers. A. line shaft conveyors are quite as few motors are used, chain and belt tensioners also stop the rollers from vibrating. 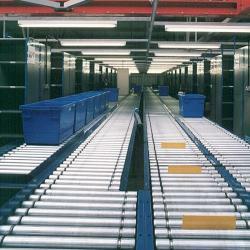 Technology has moved on in the last few decade providing us with much quiter conveyors. Q. Can I use any products with my line shaft conveyor. A. loose products like powders or small products would get stuck in the rollers it is best suited to flat bottomed products or larger goods. That is not to say that irregular shapes can not be used we would just need to select the correct rollers and pitch run on..
Q. Can I use wet and sticky products on my conveyor. A. No it is not advisable to use wet products as it can impair the frictional drive.